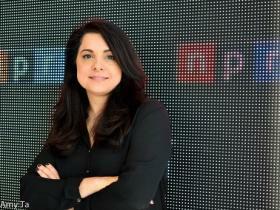 Davar Ardalan is a former NPR producer. 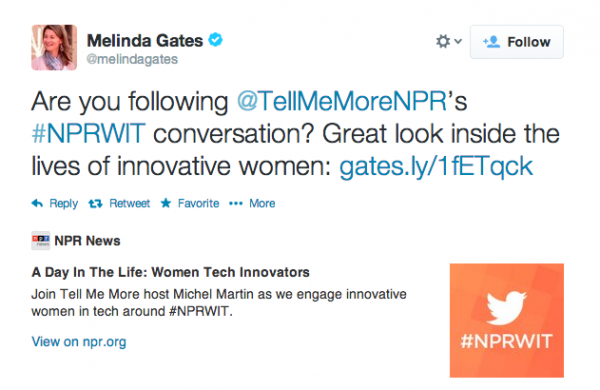 Women from technology fields in Silicon Valley to South Africa live tweeted a day in their lives using the hashtag #NPRWIT in March 2014. The series was a big success, with over 7,900 tweets with the hashtag and millions of impressions, Davar Ardalan wrote in a post in NPR’s daily social media tips newsletter. The success of the series wasn’t just a lucky hit, though. We asked Ardalan to share lessons from how it all came together. The first, and most important, thing to remember: It takes commitment and time to pull off a series like this. 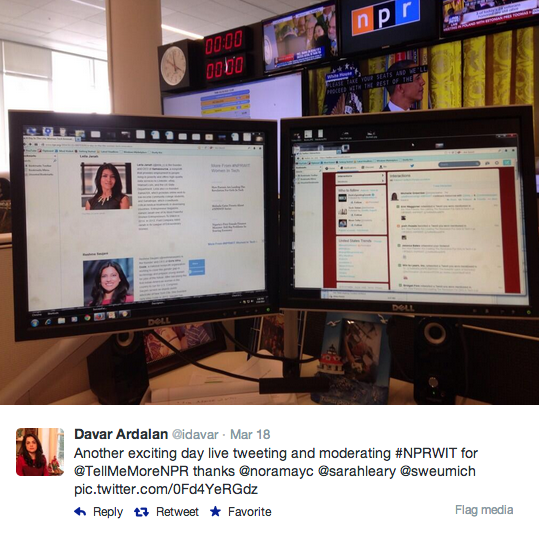 The preparation for #NPRWIT online and on-air took months. Pick your topic and research experts who are writing and talking about it on social media. For #NPRWIT, the Tell Me More team compiled a list of 40 diverse digital thinkers who are making an impact across the world and combed through articles about them to gauge their reach and impact. Additionally, they asked the on-air and online audience to tweet and email them names of innovative women. Research also included looking at the latest studies, data and stats around women in tech, which was eventually incorporated into tweets and radio stories. Tweets may only allow 140 characters, but Ardalan found that longer term chats were more effective for certain projects. Once you have a topic, pick a week or a month and dedicate that time to engage around it. This also helps with research, preparation and content planning — you can cover a variety of aspects of a topic with social storytelling in depth if you take the time to. In addition to being accessible on the radio and conversational, make sure your guest is active and engaged on social media. Some things to think about: Do they have an active following? Are they already having interesting conversations around your topic of interest? Will they bring a unique perspective — and their own audience along with them? “The network you build around these influencers is what we can tell has the most impact when you start your conversations on Twitter,” Ardalan said. These influencers can help make your conversations go viral through their own networks. Don’t just ask your guest to put the chat on their calendar. It is important to be very hands on, especially when getting participants ready, Ardalan said. Make sure you guide them in advance of the chat, so they know what to expect and exactly what to do when it’s their turn to take part. You can even send them examples of tweets and pictures to send out to their followers leading up to the event to encourage participation and discussion. Make sure you’re available for their questions before, during and after the chat. Follow each other on Twitter so you can send direct messages, and know how you can reach them while they’re chatting so you can alert them of any changes or issues. The preparation continues when the social storytelling campaign begins. Have a script ready with a beginning, middle and end. Have useful links, images and statistics ready to share as you go, Ardalan said. You can set up a command center in one space in a studio or newsroom where producers and editors involved in the chat can all communicate. After the chats, don’t forget to curate the chat together. Tell Me More used Storify after every conversation to pull together highlights, in addition to follow-up radio stories and blog posts. 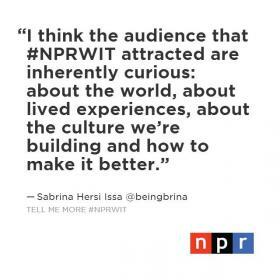 Sabrina Hersi Issa, of Be Bold Media and Co-Director of News Disruptors, shares her thoughts on #NPRWIT. A key strength of these social storytelling campaigns is that all of the planning isn’t just for social media — the materials were also utilized on the radio, in blog posts and sometimes even live events. “Social” shouldn’t be in a vacuum — it should be part of a well-rounded conversation.